Isn't it all such hard work!! Christmas I mean, especially for all us Papercrafters. The pressure to send a handmade card ('cause we have so much stash) and we know we ought to take the biggest opportunity of the year and show off our skills and all our friends and family will be expecting something, handmade, spectacular, and really special that we have made ourselves. On top of the fact that we have to shop till we drop, then make a cake, a pudding, mince pies, bread sauce, stuffing etc etc etc. Buy and wrap (sometimes creatively!! ), presents, wash, iron and change beds ready for the family. OMG!! do you feel as stressed as we do? Answers on a (handmade) postcard, or better still an ATC please!! So, how impressed are we to receive the card featured here in the post yesterday, with a note from the lovely Jayne of Butterfly Kisses apologising for being so busy and not able to send any samples of silkies (Yet - watch this space). Please girls do not apologise, how did you manage on top of all the other stresses at this time of year? For those who haven't come across Butterfly Kisses, Alison and Jayne have some of the most beautiful samples you will ever see at Craft Shows up and down the country. 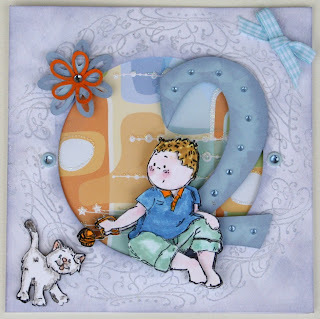 They work really hard and also produce the clever and original range of Around-2-it, clear stamps. I keep saying how fabulous the Inkadinks are and you can use them like distress inks and this card illustrate this beautifully. Using such a restricted colour palette is really effective and the Inkadinks sit beautifully on the smooth cream card. 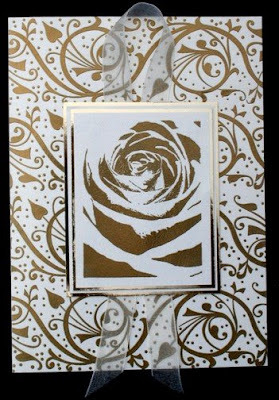 Dab some inked up cut n dry foam around the edges of the card to complete the look. Some curled dark blue wire and cream and blue organza ribbon completes the look. Simple, stylish and so effective. So we are using Jayne's card to wish you all a lovely seasonal time and at least you can really relax in just 48 hours time - YES!! Big and Juicy Ink Pads and a few techniques! AT LAST!! They have arrived - so many apologies to everyone who has been waiting for the Big and Juicy Ink Pads. The container was delayed from the US and so we have waited an extra month for the delivery - anyway they are here. Check out the Web Site for colours and availability. The Price is £9.90!! so why not order 2 sets so that you get your free P&P!! Remember we have really limited stocks (should have ordered more!) so make sure you don't miss out. For those of you who are unsure how to use the Big and Juicy Ink Pads, these are the gorgeous fellas that you use with your Brayer. The thing to remember is always roll the Brayer in the direction of the ink (use the lid to remind you!). Check out the price of our Brayers, they are really good value too! Don't forget that you can use the Big and Juicy Pads for the resist technique. Stamp or roll an image onto glossy card with Versamark, ink up your Brayer roller with Big and Juicy Ink, roll some of the ink off onto some kitchen towel and then roll over the stamped image. Do this 3 or 4 times until you are happy with the effect. Polish over the top with some kitchen towel. The Versamark image will 'pop', through the ink. You can also dye ribbons on the Big and Juicy pad. Lightly dampen white or cream ribbon, then pull the ribbon through the colours you like, do this on both sides of the ribbon. Pull through one colour at a time, back and front. Leave to dry and iron, your ribbon will then have a 'spaced dyed', look and will match your card. It is a really delicate and pretty effect. If you like stamping onto fabric, use the same technique to dye your fabric. As I always tell you at shows, Dye Ink - think - Dylon!! Damp the fabric and then scrumple up and dot and dab onto the colours you want to use. If you want a more controlled, softly marbled effect, iron the fabric straight (or if you want lines in it don't iron it! ), place onto some greaseproof paper, use a piece of sponge, take colour from the Big and Juicy and dab onto the fabric until you like the effect. Let it dry, iron, stamp onto the fabric with Versafine or a good craft ink pad. Stitch into the fabric, add beads and couch threads for texture. You can do exactly the same effect on handmade paper or even good quality watercolour paper or card. Sponge on the colour for the background, dry, iron (under kitchen paper), stamp and stitch on top for all the latest effects. At long last the worst of the 'bug', has subsided, it takes so long to recover from these things in this horrible damp winter, so depressing. The only bright light on the horizon at the moment is the continuing fab work of our http://www.allpinkgirl.blogspot/ aka Dawn! She is beavering away with the Inkadinks and the Silkies even while her little girl is also suffering from some vile virus - well done Dawn, keep up the great work! This great card above uses another of the great Ollyfant range of clear stamps that we love so much here. Alot of the cutie stamps are images of little girls and we often get asked for boys, so this card fills that gap and it is quick and really easy to make, great for autumn/winter birthdays and great for using some patterned papers and a die cutting machine. The big bonus of this card is that you don't have to use a die cutting machine if you haven't got one! So using Autumn 2, code no 0902 and a dotty cuttlebug embossing folder on some core d'nations cardstock to create some textured background, patterned paper and paper flowers and ribbon makes a quick simple background. Stamp the little boy and the dog and colour in with marker pens, cut out and stick on with double sided foam pads - quick and easy!! During the last round of shows we have noticed how many brand new crafters there are - which is fantastic news! We all get excited when we can welcome someone new into our magic creative world, as we know what an exciting future waits for you out there! The difficulty is how to inspire and advise new crafters, so that they realise their full potential and don't make expensive mistakes which can be really off putting! How many times have we all bought so much new stash and it stays at the back of the cupboard - we've all done it! So next year we are on an Imaginative Crusade to try and unravel the technical world of inks. So many people get confused about inks and like everything 'it's easy when you know how'. We need to give people confidence to move on from cutting out and sticking on. Nothing wrong with with that, but it is really exciting to be able to learn some new techniques, put them all together and produce something even more inspiring. What we have learnt from talking to people at shows is that they lack confidence and information and making the leap from licking and sticking to inking and stamping seems daunting and scary. We know it isn't but it is like riding a bike or using a sewing machine if you don't have a success early on and you keep falling off and don't enjoy the experience you don't want to carry on. So, here at Imagination (true to the name! ), we want to try and guide and inspire but most of all give lots of information to help people to make the right choices. If you have any hints and tips that have inspired you on the way, please let us know. It might be something that you stumbled on that really made a difference to your papercrafting. Using a particular product, learning a particular technique, seeing a particularly inspiring demo or just sharing ideas with a friend - share with others let us know and we can pass it on. We are so lucky to have such a great team here who all work hard behind the scenes to make us a success. Heather, is, as we speak, designing new rollers. She will also be inspiring retailers at the Craft show in February. Her Workshop using the Silkies will be one not to be missed. She will be assisted by Harvey and I think we can say hand on heart, this will be a double act not to be missed!! Jennifer is working with the silkies to make some more of her amazing samples for next year. Michelle is tearing around the country teaching and demoing. Susan is on Create and Craft every week for the forseeable future with her papers. We are always looking for new people to join our design team, so if you would like stash and stamps in return for sample cards just get in touch. No piccys here today, but you just have to go to my friend Dawn Wheeler's allpinkgirl blogspot - www.allpinkgirl.blogspot.com to see what she has done with the Inkadinks and silkies - she is just such a talented lady as well as being such a nice person. She has a real passion for papercraft and she does it all for love! Well we're back and laid low with the usual winter bout of goodness knows what. I suppose if you are amongst 65000 eager crafters for 2 weeks (Glasgow SECC and Birmingham NEC), something has to give!! It started with the sorest throat and chest, went on to a hideous cough and now we look like little frogs, with big swollen eyes! It's a hum dinger - believe me! Anyway we'll live. All this activity throughout the country has meant that our blog has been sorely neglected and for that we humbly apologise and we intend to do something about it from now on. Anyway the best news ever is that our beautiful Silkies and the amazing Inkadinks have caused such a rumble in the jungle. You all absolutely loved them and we could hardly keep up with the demand at the Shows. I think it is because they are just so easy to use and really addictive. Once you start using them you think of more and more techniques that you can use them for. I just love the fact that they paint straight on to acetate and dry really quickly. If you love backgrounds, stamping, printing and playing about I promise you will not be disappointed. Joanna Sheen loved them and will be featuring them on her web site in December. I do want to say the biggest Hello to all the lovely lovely ladies from Ireland who came to see us on ALL 4 DAYS at the NEC, they were wonderful. We hope you are enjoying all your products and thank you so much for being such a lovely fun crowd of girls. Harvey still hasn't got over the marriage proposal and with the Irish name and the fact that he absolutely loves Ireland we could lose him soon!! We are spending some time with the family next week - we just can't wait. We all work so hard and time together is really precious. We will be making Christmas Cards with the children and introducing them to some 3D paper decoupage - on an elephant!! I think a 5 year old will enjoy all that gluing and sticking and she will have a lovely elephant at the end of it!! Barney is really pleased to be back home, he has spent so much time at Animals at Home this year, he doesn't mind, as he can sleep on the sofa but there is no place like home, even to a soppy old spaniel! We are really looking forward to some creative time back in the Studio, we love getting out and about but other things suffer, so now we need to put that right. Keep Watching Girls - we do appreciate your support. The time has come for craft products to look beautiful and our new Silkies look stunning! Lovely, luxurious and satin soft Silkies are a new concept in colour, we have managed to blend our mica pigments into a chalky, satin finish that looks incredible on Acetate, glossy card, card, paper, candles, glass, clay, metal and most surfaces you can think of! The colours are quite breathtaking and those of you who bought them at Port Sunlight and Hinckley have already said how thrilled you are with the satin soft texture and blendability. We have packed them into glass bottles so they will last and last as well as looking good. So you can use them straight away we have included a brush in the lid, just like nail varnish. This means you can apply colour directly onto so many surfaces. Because they are a water based product you can dilute them with water, for spritzing but one of the great advantages is their affinity with acetate, just try something quick and simple like stamping or rolling and embossing onto a piece of heat embossable acetate, turn the acetate over and then paint in on the reverse with the Silkies. Turn the acetate back to the front and just look at the satin soft colour underneath, truly fabulous, you will love it. Heather had just 48 hours to work with the Silkies and she produced the most beautiful card using the Silkies sponged and blended together on the background. Using the little Sponge finger daubers makes blending so easy. She then stamped over the top and the effect is really special. Come and have a look at the card in Glasgow and Birmingham - you will become a Silkie convert. 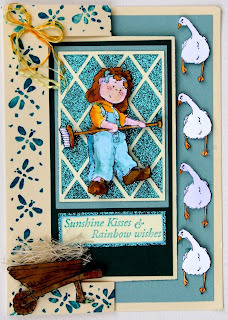 Heather also applied the Silkie colour direct to the stamp and stamped with it, giving a soft watercolour effect. They are such a versatile product and we can't wait to produce some more samples for your delectation and delight! Best of all they come in sets of 4 and cost just £10.99. Time permitting we will get them on the Web Site just as soon as we can. It is completely manic here at the moment. We are girding our loins (nearly put lions!) for Glasgow (Stand No M20) and Birmingham. Everyone is pushing the boat out. 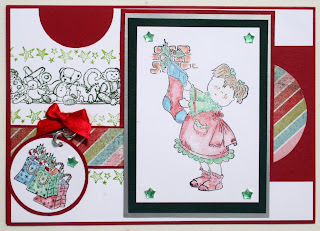 We are running workshops in Birmingham and Michelle will be showing you how to use the Rollagraph and her latest stamp to make a christmas card. We are working on a simple contemporary colour them of black, white and silver, we think you will love the result. The workshops run everyday, starting at 10am and last 45 minutes, the last workshop will be at 4pm. They are completely FREE but you have to come to the Stand, F20, at the NEC to book, first come, first served etc. You will also receive a 10% discount voucher when you have attended the workshop to spend on the Stand at NEC - so it is all good stuff! Plus we will have all our usual fantastic prices - have you noticed we are also one of the cheapest companies in the country for ink pads - take note! 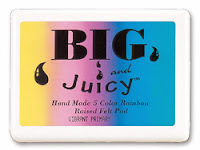 All the new Big 'n' Juicy have sold out - we are waiting for the next delivery and our price is just £9.99. That it for now but when the mayhem is over and we have put thousands more miles on the clock we will (hopefully), be putting some 'how to' video clips on to the system to give you some inspiration for the holiday period and we will be putting lots more of the sample cards on the blog so that you can remind yourselves how to use all the goodies you have bought this year. NEW! NEW! NEW! We have managed to obtain just a few of the brand new Big 'n' Juicy Ink Pads. It is so incredibly exciting (what has it come to when the arrival of new Ink Pads send us into a frenzy of excitement and creativity seems the only passion to indulge in!!) - scary really - only other Crafters can understand the feeling that comes over you, when you open the box and see them lying there. Tantelisingly close, the colours glinting on the lid, the ink oozzing out onto the felt ........ what a feeling!! The biggest question of all is have we time to put them on the web site or do we take them to the Show - decisions, decisions. If you feel really strongly about it and want to be the first to have one - email now and let us know before its too late and into the Van they go!! (We will be getting some more in 3 weeks - if you can wait that long!!) but they will be going to Birmingham. I am surrounded by them and I have lost my heart already to Hydrangea, all that Agean sea colour of turquoise, blues, deep lilacy purple, lavender pink and cerise (my favourite colours altogether). On the other hand Mountain Meadow is sort of sunset in the Alps colours, there again Soothing Sunset is your favourite cocktail on holiday sitting on the balcony when the sun sets on the horizon, watching the brilliant firely organges, yellows, peachy pinks, lilacy pinks and purply pinks blend together. Foliage is for all of you who want an alternative to Spice and love Autumnal tones with a slightly antiqued edge. Vibrant Primary has it all, blues, pinks, organgey yellows - they are all fantastic, plus the fact that we are one of the cheapest suppliers in the country at the moment for ink pads - check us out. The craziness goes on!! After a great show at Leigh at the week-end - thank you everyone who attended and welcome to lots of new customers - we love you all!! We are girding our loins for the 'big one', this week-end at Port Sunlight, HSNW - a veritable Stamp Fest. Followed the next day by Hinckley - not that breaking down one Show and setting up another on the same day isn't fun and games- Help!!!! Heather is beavering away finding yet more fantabulous ways to show you how to use the Inkadinks on acetate. Unfortunately our suppliers can't get more supplies of her gorgeous Pansy stamp to us in time for the Show - they are due to arrive next week - not good enough but nothing we can do. It is ssooo frustrating when something is really successful and we can't get more supplies in quickly enough. But as ever, she has some other scorching ideas up her sleeve using Acetate, which we all love. However, we have got more Country Christmas roller, which you all loved so much - we sold out. Heather's, spritzing with the Inkadinks and bleaching technique is so easy and effective, you just have to come and see it! I must say it has been a bit touch and go over the past few weeks with both Harvey and Heather suffering from the dreaded lurgy but neither of them gave in they carried on going. So many people seem to be suffering - the cough has been horrendous! However, I am delighted to say that they are both on the mend just in time for the weekend. JJ (our Jennifer), has excelled herself with this week's card. She has used one of the new Gillian Roberts stamps, (Mistletoe and Mice), that have nearly all gone - (already we have only had them a couple of weeks, again if you want one phone or email to check stock). She has used the Hearts and Flowers Roller in the background, inked up with Black Cherry Staz-On Ink. She has also applied the Black Cherry around the edges of the white heart and blended it with Cut n Dry Foam. She has stamped the mice with black staz-on ink, coloured them in and decoupaged them several times. She has finished the card by tying green sparkly thread through the buttons and sticking them onto the card. So, so, sweet and to ring the changes she has also used the same image and cut off the mistletoe and put a bunch of flowers there instead (how clever is that) and used the card for an Anniversary! I do love stamps that you can use for more than one occasions. This idea would also work with this stamp for birthdays and Valentines Day. Anyway, enough for one day. See you all in the next few weeks. At long last time to blog! It has been incredibly hectic for the last month, shows, shows and more shows! 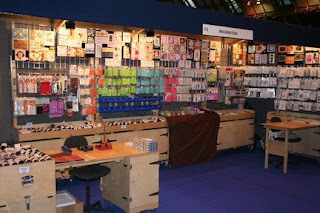 Manchester, Harrogate, Sandown, Exeter, Ally Pally, Leigh coming up this week-end and then the Creme de la Creme of stamping shows, Happy Stampers North West - 6 hours of unbelievable stamping madness and extravaganza! I love it- this is a real stamping show unashamedly devoted to passionate rubber stampers. I think Liz and her team are amazing. They organise this festival twice a year and they do it purely for the love of stamping - not for profit but just as a festival of stamping. The organisation takes months and months of work and they do it all voluntarily so that both visitors and exhibitors alike can indulge in a veritable feast of stamping. Another lady who receives this months award for incredible service, beyond the call of duty, is the lovely Heidi from Stampavie. Can you believe it, she came all the way to Ally Pally just to deliver stamps and hugs. She and Stuart her husband left home at 6am to fly to London to come to the Show and were kind enough to deliver our stamps to the show. How many suppliers would do this? Don't you just love the two cards we have featured here. Again thanks to Heidi for supplying them and to the amazingly talented Claudia Rosa (http://www.rosawelt.blogspot.com/) for creating them. They are of course using the wonderful Sarah Kay stamps that we are now stocking and these cards illustrate beautifully the point I made earlier about fabulous creativity with rubber stamps. The lovely balance of colour, pattern, matting and layering alongside stitching detail and sublte colouring with copic marker pens has produced two sophisticated elegant cards which show the stamps to such advantage. Note the delicate herringbone stitch around the edge of 'Christmas Preparations', (shown below), such attention to detail. We are so lucky to have these works of art and we are really grateful to Rosa and Heidi for allowing us to feature them on the blog and also to display them at up and coming Shows in Port Sunlight, Glasgow and Birmingham. Come and see the cards in the flesh, at the Shows, they are even more beautiful close up. We are really thrilled with the response to Heather's new demo featuring the Inkadinks and Magi Blend used on acetate - you all went completely crazy for it and who can blame you! 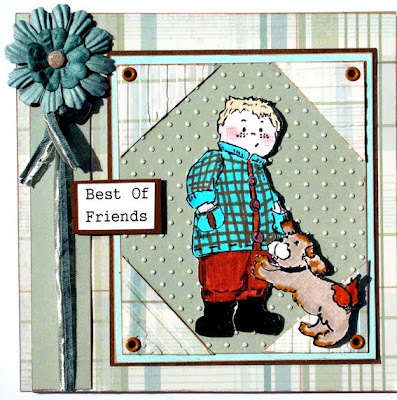 Heather's new Pansy Border Stamp, stamped onto acetate and coloured with the Inkdadinks got you all very excited. If you haven't see the demo come and see it at the next few shows - you will be ssssoooooo impressed. Heather works really hard behind the scenes to give you something new and exciting and she has come up trumps this time. We are going to be running Make and Take Workshops at the NEC this year and if you need a refresher course with the Rollagraph or you have been thinking about buying it but haven't quite made it come and have a go with Michelle. 45 Minutes - and it won't cost you a penny to do the Workshop - it could change your creativity for ever - at least we hope so!! Finally a huge thankyou to Lesley for helping out at Exeter. She has bucket loads of enthusiasm and it makes such a difference when there is someone who has time to chat and explain things. Also she does a mean Cibatta! These things matter when you are too busy to eat during a show! and the Chocolate Truffle seashells were to die for! What a fabulous start to our Winter Ollyfant Gallery on this Blog. We might not Blog often enough but when we do we do try and go for it! I just love this card! I love the layering using pale blue, cream and silver mirri. Jen Freeman our newest designer has a great sense of colour and she uses background papers so well and of course the Ollyfant stamps are fantastic, not just because the sets are so well put together and you get such lovely little accessory stamps that you could use with any stamps you already have, but they are so 'useable'. By this I mean you can make so many variations out of just one set and I truly believe they are the very best value for money around. I know I keep banging on about this but it is TRUE! They are all intermixable, so by buying a couple of well chosen sets you can have dozens and dozens of combinations. Have a look at some of the other samples, they are all so different and such fun, you really can't go wrong. This card uses the Autumn set of Ollyfants. Stamp the little girl out twice, once onto white card and once onto red gingham. To dress her cut out her clothes from the gingham card and once you have coloured her in stick her clothes onto her, as in the picture. For the background you could use spotty card or use a cuttle bug embossing Dots folder and highlight the dots with a red pen and then some glitter. Use one of the new Martha Stewart punches for the trim or nestabilities or a die cut frame shape. Don't make life difficult for yourself take the idea and adpat it with whatever you have to hand! 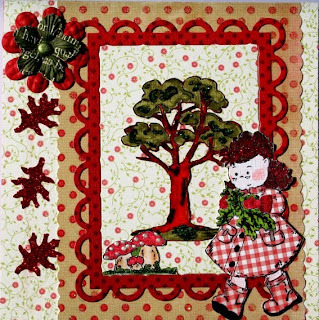 This is a really lovely lively card for Autumn birthdays. 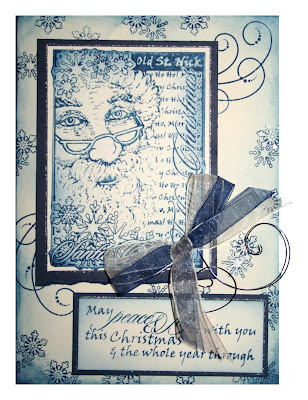 Jen has created a quick easy card created with torn decorative papers. The little details make it special, the tiny little heart buttons tied with a piece of green thread bring this card alive. Do you have problems thinking of what to do with fusible fibres, or angel hair. 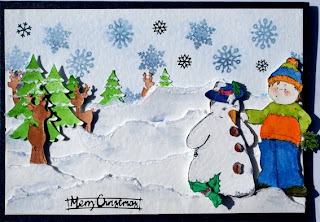 They don't show up well on the screen (so many things don't) but in reality this card shimmers and glows as the background uses fusible fibres behind the Snowman and mica powders dusted all over the background. We have got some lovely new colours of fusible fibre and all you do is make sure you work on a heat proof sheet. Place your heat proof sheet on your ironing board place the paper on top, place your shredded combined fusible fibres together onto the surface, place another piece of paper on top, iron over with a hot iron but please take care using the hot iron etc. The combinations are endless and can be really spectacular. The corners are decorated using the Snowflake rollagraph. Yes! Its' that time again! You all seem to love the Ollyant Stamps so just to feed your creativity a little more we are going to feature some more 'Cuties'. You will also be introduced to our newest designer Jen Freeman, who really knows how to put paper and stamps together. 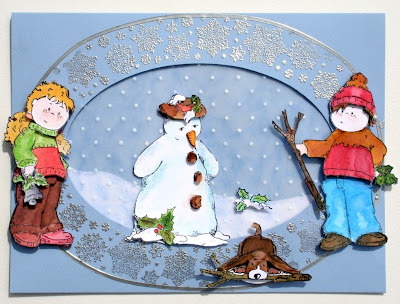 The Winter Snowman set is just the best and you will be able to see just a few samples of how you can get so much out of just one set of stamps. 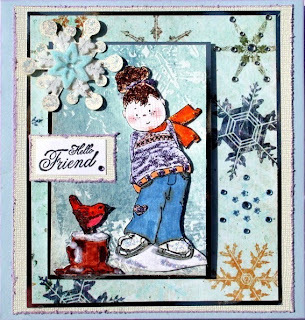 Paper tearing is so in at the moment and Jennifer (our other Jennifer)has used it so effectively to layer up the snowdrifts on this card. Aren't the little reindeer cute, I love their snubby noses as they nestle in the trees. What I also really like about the Ollyfant sets, is that you can intermix all the sets together and at an even better price this month of £5.89 they are even better value than ever before-and they were great value even then!! At last a new post from a very wet and windy Dorset - what happened to all that sunshine? Well - the new garden Studio is up and running and very smart, so at last we will be able to run courses and workshops - for all of you who have been asking. We have just finished filming the new DVD, what an exhausting experience! Heather has worked so hard producing lots of step by step and finished samples and after days of filming we are now busy editing, splicing and cutting - we know how Richard Attenborough feels now! Of course, we got the giggles - big time, you just can't help it seeing yourself on camera is not an easy experience, the bags under the eyes from too much laughing the night before, any crooked teeth, very traumatic - believe me! So, now even more hard work begins to try and get the DVD ready for the Autumn. There are some great projects and it really does answer all the questions everyone always ask us about the Rollagraph. Lots of teachers out there have already pre-ordered a copy, so we know we're doing it right! Heather has also been really creative and using the new Ollyfant stamps from our Web Site. These cuties have to represent the best value for money around! JUST £5.99 a SET, it really is an unbelievable price. On this set - Autumn Day 2 you get 6 clear stamps. They are fantastic, do take a look. 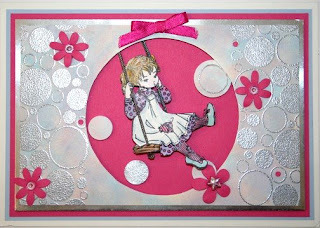 Heather has created this card using the Hearts and Flowers Rollagraph on the background papers, the Flower Patch roller behind the little girl and everything is coloured in using the Inkadinks! - How easy is that! Also don't miss this months edition of Creative Card Making Magazine from your local craft shop or by subscription, as there are three articles in it using the Rollagraph, all produced by us of course! So there is alot going on behind the scenes at Imagination at the moment, we are working on new techniques and we will keep you posted about new masterclass videos on You Tube, so that you can get the most out of your Inkadinks and your rollers. Michelle is busy working on our new Logo, when she isn't Camping (in this weather - crazy girl!!). Jennifer is working really hard on producing new samples, we have a new designer joining our design team, Karen, more about her later. Heather is really busy on just about everything!! We hope to have some incredible new rubber stamp releases in August from both Michelle and Heather and Harvey is hoping to sccop a BAFTA award for Production!! Sue is busy teaching and spreading the word about our amazing Mica powders, all her students are using them now and loving them - so never a dull moment - keep watching! Again Jennifer has used the Standard Rollagraph with the Dragonflies as a border, it almost looks stencilled and it gives a really pretty effect. 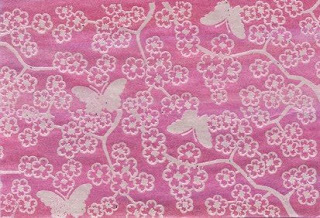 I love this roller and it goes well with any butterfly stamp or as a background to a single flower stamp. Butterflies and Dragonflies are always popular and if you are stuck for an idea for a Birthday card, you can't go far wrong with either of them. We are always asked about the word stamp and this is an old Whispers word stamp but we have seen it in other makes. If you don't have it, print the words off the computer and go over them with a Gold Leaf or other permanent colour pen. The lovely straw detail in the wheelbarrow is done by shredding up a tiny piece of rough canvas fabric, you could cut up cork to look like logs, or colour bubble wrap to look like stones. Staz-on adds colour to bubble wrap. Isn't she lovely! 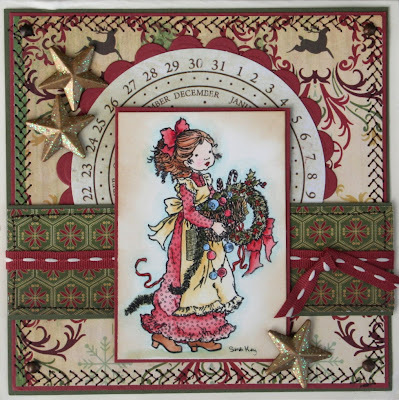 Again Jennifer has used the Ollyfant girl in conjunction with the Standard Country Border Roller, to make a card that would fit lots of occasions. Get Well Soon, Happy Birthday, Thinking of You to name but a few. She has used the Stazon Cactus Green pad inkpad to ink up the roller, it is a really nice shade of green and to create the sky background she has used Cut 'n' Dry Foam to take the blue colour off an ink pad and sponge onto the the white 'cloud' background behind the girl. The bench stamp in this set is particularly useful, as you can use Post-it notes and the masking technique. I love accessory stamps, like benches, walls, chairs etc they can be used in so many different ways and with lots of different stamps. The Ollyfant are particularly good for accessories as you get Trees for backgrounds, the Bench, an Umbrella and all the little Creatures, so you can combine them with your other stamps. We thought the wait was worth it and it is, Jennifer has come up with some gorgeous samples of the Ollyfant stamps used in conjunction with the Standard Rollers and Inkadinks to colour in the images. Be inspired - we are!! Here she has used the Zephyr roller and run it around the outside of the circle aperture, that's the beauty of the rollers you can use them straight, curved, create zig zags and borders of your choice. It is so nice to see them used in a different way. Keep going because there are lots more examples coming up!! 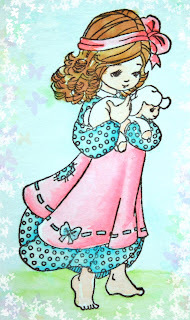 She's done it again - angeljakki - using our Inkadinks to colour a sweet little Sugar Nellie image Spring Lamb. If you haven't already visited angeljakki.blogspot.com, go and have a look now! 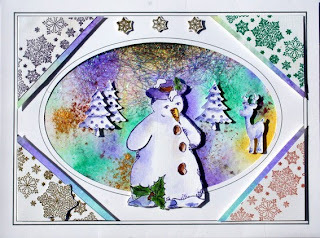 If you feel lacking in inspiration or you want some ideas for using the Rollagraph and the Inkadinks there are some beautiful cards on this blogspot that will make you feel you want to rush to your craft table and create! Inkadinks are so easy to use, straight from the bottle with a waterbrush or water them down for a soft watercolour effect. Mixed with mica and water and shaken (not stirred), Inkadinks, will give you beautiful soft shimmering colour that glides onto the paper. They deliver that professional finish that we are all seeking to achieve in our colouring. Happy days are here again...the sun is shining and the daisies are scattered in the meadows. As you can see we are feeling rather poetic here in Dorset, where the sun is hot and the urge to plant up those tubs with geraniums and clouds of michelmas daises is quite overwhelming. We think we might change Barney's name to Buttercup as he is springing through the fields gathering yellow blossoms in his fur as he bounces along and he looks so sweet with his curly spaniel ears dotted with tiny yellow flowers - quite flower power! 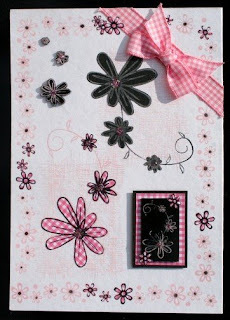 So, with that in mind we thought we should try and inspire some summer cards using Michelle's lovely Daisy Chain stamp. We have inked up the stamp with black memories ink onto pink gingham paper and cut round it, we have used silver and pink brilliance to stamp out a few other daisies. We stamped with the pink brilliance onto a piece of black shrink plastic to heat shrink down the design, we decorated the edge of the card with little stamped flowers, added a pink gingham bow and assembled a quick simple pretty card fit for any summer birthdays. We all had a day out at the seaside yesterday and went down to Swanage. It was fantastic, the sea was a sparkling azure blue and we sat in a cafe on the quay side and ate seafood in a white wine cream sauce with so much garlic we were transported on the fast ferry (which we saw leaving Poole harbour!) to the cafes in St Tropez! - who says you have to go abroad for sun, sea and sangria - we can recommend Swanage. After lunch we walked along the South West Coastal Path, sat on a sun drenched cliff and lay in the grass watching sky larks and listening to the crickets chirruping in the grass on a hot afternoon - bliss!! We also stopped off in Corfe by the Castle and had the biggest and best cream tea you have ever tasted - it was superb, the fluffiest home baked warm scones, home made wild strawberry jam and clotted cream - Oh! Oh! Oh! So we are now definitely on a diet today and its cottage cheese for lunch (low fat of course - yuk!! it is truly vile), crackers and a stick of celery - yum yum!! At last we have slowed down a bit so there is now time to be creative! After the overwhelming enthusiasm at the Happy Stampers show (what an amazing turn out) and at Leigh we can concentrate on summertime cards and some of the new Rollers. I think you'll agree that this card shows just what you can do with the Rollagraph. Most people think you can only use them for backgrounds but with a bit of lateral thinking when you are choosing a pattern you can use them for the whole card. We know lots of you want more inspiration so we will be concentrating on showing you lots of different ways of using the rollers in the next few weeks. 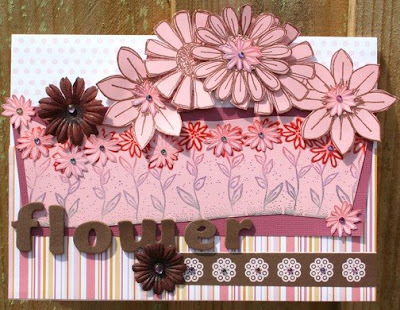 This card uses the Flower Patch and Four Flowers Jumbo rollers. Part of the fun of the Rollagraph is that you can use it on a curve, start on one side and as you push along gently curve the roller up and down as if you are pushing the roller up and down hill! You can use any of the lovely bright coloured cartridges to load into the handle and then trace over some of the flowers with a gel pen to make them 'pop', out of the card. Roll two designs so that you can cut one up, to add extra little flower heads on the card for emphasis. Matting and layer with a darker complimentary colour always makes the design stand out more. Heat emboss the Four Flowers roller with our very own Bronze detail embossing powder, its so smooth and shiny. Cut them up and use a few paper flowers in a contrasting colour, stick on a few tiny tiny gems and layer up as we have done here. If you want a relaxing afternoon in the sunshine, have a go at the card above, it is perfect for a summer birthday or anniversary, or even a really special Get Well Soon card. We are so excited here in sunny Dorset because Heather and Michelle are hard at work producing some more fabulous rubber stamp designs for us. Heather has excelled herself with some new roller designs, they are beautiful and we can't wait to launch them at the Autumn Shows. Heather is also preparing herself for her filming debut for the DVD which will be filmed in July ready for the Autumn. This is in response to all those of you who keep saying to Heather "I wish I could take you home with me so that I won't forget what you have shown me", well your chance is coming up!! She could be in your house in time for Christmas (as they say)! 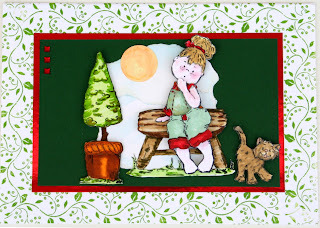 Michelle has excelled herself this time with her stamp designs they are absolutely gorgeous and you will see her demonstrating them at the Christmas Show at the NEC, her Snow Tree will be the most useful stamp you buy this year!! There are so many ways to use it and we can't wait! We have got some amazing new products on the web site and judging by your response at the last few Shows you couldn't get enough of them! The new Ollyfant clear stamps and the Kitty de Wolf cute stamps having been flying out the door and at £5.99 and £3.00 !!!!! for all those designs who can blame you!! Aren't they incredible value - we do out best. Also for all you Arty crowd do check out the beautiful new Glitz 12 x 12 papers they are fabulous and such a good price for double sided paper. Enjoy the bank holiday sunshine! We're back from warm sunny London and Ally Pally to get ready for Shepton Mallet and slow dreamy Somerset - what a contrast that will be. I do love the 'buzz', of London but the driving this time was completely crazy! People driving up the wrong side of the street and on the pavement - mad, bad and not nice to know!! But the view from Ally Pally on the top of hill right out over the park with London set out in front is quite a vista and it never fails to thrill. Phew! we were sssoooo busy and sssoooo hot but we upset our favourite security guard Baz because we left Barney at home. He brought his (Baz's and Barney's that is) favourite Garlic sausage so he could feed him, so we were not popular and to get his own back he dumped the Garlic Sausage on the Stand and what with the heat and all, we smelt a bit 'allo allo' and I am surpised we weren't wearing berets and smoking Gauloise by the end of the day!! So I apologise for the not so delicate French aroma of our Stand on Saturday but Baz's garlic sausage got a bit overheated! We did contemplate buying a baguette and offering it round but we weren't sure how many birthdays it had had!! Anyway the thought was there and that's all that counts - thanks Baz and just for the record Barney's paw is better now and the lampshade has come off - thank goodness! However Barney's penchant for Poodles hasn't diminished as evidently he 'met' one at the week-end so I think the French influence stretched back down to Dorset and there was a bit of 'entente cordiale', going on back at La Maison Imagination! We do hope you like this week's card. We thought we would feature something cool, calm and contemporary and as 'lurve', seemed to be in the air (rather than garlic sausage), the lovely Simon and Lola from Sugar Nellie seemed very appropriate. We will be featuring lots of cards from one of our most talented card designers Jennifer Johnston, on the blog. She has been on our design team for some years now and she has some brilliant creative ideas as you will see in the coming weeks. 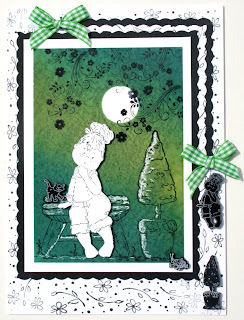 Here she has used our fabulous new Chunky Boss, thick embossing powder. As you can see it is so smooth and flexible and even though it can be used in the same ways as UTTE, it can be used in a single layer as well as being layered up. The beauty of the Magi-Boss Chunky is that it is flexible, so it can be used for really fine work. Jennifer has used a Die-Cut shape, inked it up with versamark and heat embossed with 2 layers of Mother of Pearl Magi-Boss Chunky. Even on the photograph you can get some idea of the incredible smoothness, shimmer and shine that you can achieve with the Magi-Boss. The photos of the powders on the web don't do them justice, they are a really good price and used with punched out shapes and blended together, particularly using the Diamond Black Knight as a base they are a stunning addition to your stash. Use them in your Melt Pot as well as on cardstock. Enjoy the sunshine, we are hoping to have a lawn this year, and Harvey has put up one of those little garden tent gazebos, so I can craft outside in the sunshine, so on the folding table from Argos with Barney stretched out working on his tan, dreaming of a follow up meeting with La Belle Fifi, I shall enjoy working on our exciting new designs ready for the Autumn. Just a quickie Blog as we are off to Ally Pally for the Big Stamp and Scrapbooking Show this week-end. The weather is usually really sunny and hot, we will see if this year is any different! Barney isn't coming with us this year as he has cut his paw and is now wearing a lampshade (Buster Collar) and looking very sorry for himself. So he is staying with friends who will feed him Bonios and feel sorry for him! Isn't the piccy above gorgeous! We just wanted to show you what is possible using the Inkadinks and the jumbo rollers! Don't be nervous about using the Inkadinks because we send you our famous Step by Step instruction sheet, so you aren't out on your own with them. Lots of hints and tips enclosed. This beautiful sample was produced by inking up the Dogwoods roller with versamark, onto Pearlescent card, heat embossing with Detail White Embossing Powder and then sponging the Cranberry Sorbet ink over the top using Cut 'N' Dry Foam which is now BACK IN STOCK!! The embossed image acts as a 'Resist' against the ink. It is that easy - just mat and layer!! Lovely for an Anniversary, Wedding or Spring Birthday card. Don't you love it when something is so simple and beautiful. Of course, we have our Heather to thank for this lovely sample and of course it is just one of many. Thank you for your lovely comments about our Demos at the Show, we know how much you enjoy Heather's creativity and it is so nice to hear that you do. Well back from North Yorkshire and one of our favorite haunts, Harrogate. We are all at least 1/2 stone heavier as the food in the Hotel, out in the countryside was superb! Even Barney has put on weight! Don't you just love this week's card featuring our new incredible, amazing Magi-Boss Chunky embossing powder, we have used a mixture of the Copper and Gold on this one. 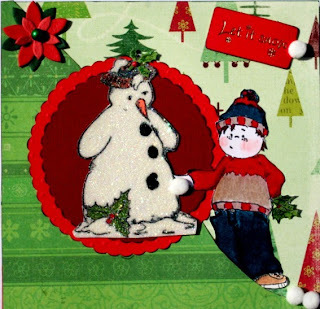 Jennifer, one of our really talented designers made this one using the Doodles Rollagraph. 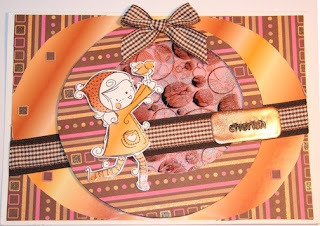 She used the Chocolate Cartridge for the colour on the background and the amazing Versamark Cartridge for the foreground embossed doodles on the mid brown cardstock. She used Versamark to ink up the diamond shape and then a mixture of Gold and Copper Magi-Boss Chunky Powder heat embossed, to a smooth melted layer before pushing in the rubber stamp inked up with Black Memories into the Chunky Powder. She left it to cool for a few seconds and the released the stamp. Magi-Boss Chunky has a different consistency to other UTEE powders in that it remains flexible after heating. Other powders can crack and split off the card after they are layered up and cool. Magi-Boss is flexible and therefore incredibly smooth when it is cool, as you can see from the photo, the reflective qualities of the powder are beautiful and because it has been designed to be used either alone or mixed together, using the shimmering colours together, Shimmering Green Grass, Shimmering Blue Mountain and Shimmering Deep Purple will give you incredibly beautiful reflective backgrounds. We have also produced a Mother of Pearl Chunky Boss and you can see the soft smooth pearly effect on the next card. These powders will transform your crafting so do give them a go. It is difficult to get decent photos of them for the Web Site as you can't get the reflected qualities in a photo or scan but you can see the results for yourself on these samples. How about a change from rollagraph - I know we are obssessed by the wonder roller here at Imagination but we also have a fabulous range of rubber stamps. As you know we pride ourselves on working with some really talented UK artists who provide us with original artwork for our stamps. Michelle Johnson is one of our artists and she also works as a creative designer for Making Cards Magazine. 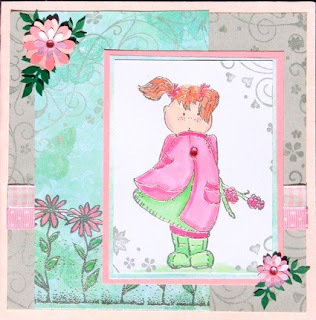 This month in Making Cards Magazine she is featured in the On-line Gallery using one of her stamps that she has designed for us called 'Flutterby'. It is one of our most popular stamps and Michelle has designed two lovely fresh pastel cards using chalks. They are quick and easy to do and their classic design would be suitable for Spring birthdays, anniversaries and congratulations. Also featured on the Making Cards site is one of the Sugar Nellie range of rubber stamps and as many of you know we are the only Craft Company with a special licence to sell Sugar Nellie at the Shows up and down the country. We are in Harrogate this week-end and we will have a new delivery of Sugar with some stunning samples on the display boards on the Stand. To access these projects go onto the Making Cards Web Site at www.makingcardsmagazine.com/projects/, they are under the title Spring Sensations, click Download pdf file and fill in all the boxes, make sure you fill in all of them even if you are not a reader, it takes 2 secs, click on download pdf file again at the bottom of the page and it will bring up the two featured projects. Please come and say hello at Harrogate and take time to see Heather's new demo, it really is sensational and if you are lacking in inspiration you will feel re-inspired. Everyone said how excited they felt after watching the demo in Glasgow and Birmingham and they all said they wanted to rush home there and then and start Crafting - so come and see what that is all about!! As everyone tells us Heather is the best demonstrator at the Shows, even other demonstrators come to watch her as she is truly inspirational and as you know, we always give you lots of hints, tips and ideas for using the products you buy from us. 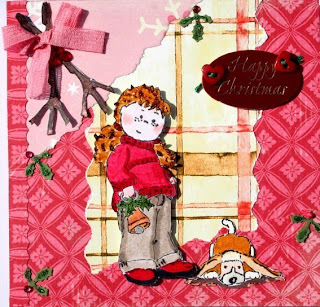 We will be featuring some more of AngelJakki's cards in our next post - so keep watching! 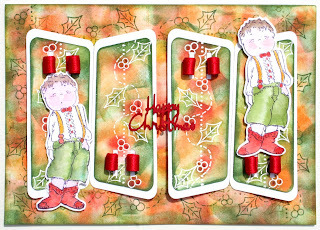 This is the first of our featured blog spot cards by other artists. angeljakki.blogspot.com. 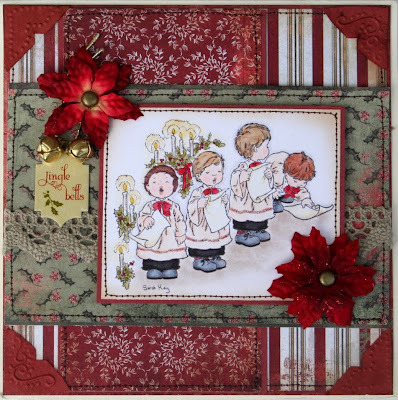 Jakki is a prolific artist and creates beautiful cards and we will be featuring her artwork from time to time. She has used the brand new and exclusive to ImaginationCrafts 'Inkadinks', which will be on the Web Site later in the week. The inks are available in 3 sets, 4 inks in each set, and the colours are Brights, Lights and Sunset. As alot of you know we sold out of them in Birmingham and they will be back in stock in a few days time. 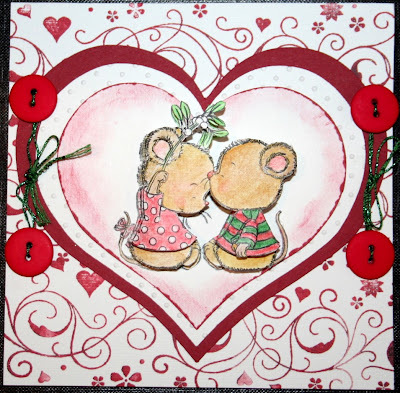 Jakki has coloured in the Sugar Nellie stamp with the inks (so much easier to use then felt tips and other colouring mediums as the colours flow together beautifully), and featured the Hearts and Flowers Roller on the righthand background. I love her use of tone on tone colour and you can see more of her artwork on her blogspot at http://angeljakki.blogspot.com. She will be doing alot more cards featuring the rollers in the next few weeks so look out for some stunning examples coming soon. As those of you who saw our Heather demonstrating the Inks at the Shows, they are incredibly versatile, mixed with our Magi Shimmer Powders, layered with our brand new Magi Chunky Boss embossing powders and already we are bringing out a Metallic Set and a Vintage Set. As ever, we give you step by step instructions and ideas how to use your inks and already Jakki's ladies want more! What more can we say. Happy Crafting Girls! We're back! Glasgow was cold and snowy, Birmingham was hot and sunny - the british weather hey! However, the welcome was equally warm in both cities. We met some incredibly talented people who have said we can feature their cards on our blog, which is so exciting - but more of them and their stunning art work later. 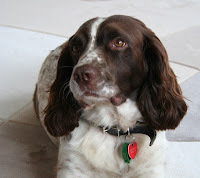 Our beautiful dog (below), Barney, is still not speaking to us because we left him behind! Normally he comes with us to Shows and spends most of the time reclining on his specially made bunk in the back of the van - complete with bed, pillow and paws softy blanket that Sue bought for him - not that he is in the least bit spoilt you understand. Instead he went to stay at 'Animals at Home', with Mike. A wonderful place where a max of 5 dogs stay as the family in the house. He has 3 walks a day and plays in the paddock with the other dogs - so it really is a 'dogs life'! Hope you like his 'Because I'm worth it photo'. We are really excited because at long last the Rollagraph Clear Stamping Guide has arrived, we have waited so long and everyone here has grabbed one to see if it really works - and Yes! it does! As well as giving you the perfect guide for borders, squares and rectangles if you want to do really long runs of the roller, for wrapping paper or you want to create your own background papers in double quick time this is the tool to help you. The best thing ever, though is that the quide can be used for other things - so even better value for money. You know how we are always going on about getting value for money. It is so easy to use, our 4 year old neice used it straight away! It can be used in exactly the same way as a stamp positioner so that you can use it with your rubber stamps. As well as using it for straight lines one piece clicks into the other - very obviously - and it creates perfect right angles. It is clear so you can see what you have rolled or stamped underneath and it has non-slip little rubber feet so it isn't sliding away from you when you use it. If you are making cards, invitations, wrapping paper etc in batches, it speeds things up no end. We have limited numbers at the moment and we only received them yesterday and we have already sent out quite a few today to Rollagraph Addicts who saw them on the Web Site earlier today. We aren't sure when we will be able to get hold of some more so if you want one order straight away. We are also really pleased because we expected them to cost around £12.99 but we have managed to get the price down to £9.50!! which is such a good price for a tool that will really transform the way you stamp and roller. It comes with brilliant instructions and a great diagram and if you have already made your investment in the Rollagraph you can't be without one or if you have problems positioning rubber stamps where you want them and getting them straight, this is also the tool for you. We will be launching them at the SECC next week and due to very limited quantities we won't have any for the NEC for the following week, so either order them now, on-line, phone up and order one or come and see us in Glasgow. We will certainly let everyone know when we have more coming in, which hopefully will be in less time that it took last time - a year, how crazy is that? Just to let you all know, Susan Amour will be blogging for us on a regular basis and keeping you updated on Imagination Happenings around the country. Lots of you know her and love her creative, arty style but lately she has worked her magic on some new Pyramage designs and it just shows that she can turn her hand to most things. 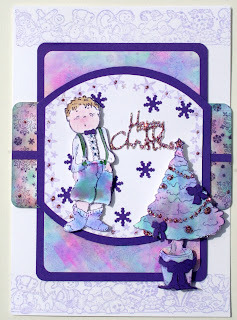 She has introduced us to a brilliant new card designer and we will be featuring her cards in the future on the blog. It is always exciting to see what you do with the Rollagraph and our featured rubber stamps and we are constantly inspired and in awe of your creativity and work. We want to thank all you lovely ladies who discovered our Slide Mailers and spread the word - we can't wait to see the results. A quick word about our Sugar Nellie rubber stamps. As you know we sell them exclusively at Shows around the country and we have just taken a huge delivery of lots and lots of 'cuties' for our next two shows in Glasgow and Birmingham, NEC. Our designers have been working really really hard to produce some truly inspiring samples - we know how much you love our sample boards - and Heather will be showing you how to use the new Inkadinks and Micas to produce the perfect skin tone colour which is so difficult to achieve with normal felt tips and other colouring mediums. So come and see us next week and cheer us on - we love meeting you and putting names to faces. Hi Everyone, at long last, after numerous requests, here it is, The Imagination Crafts Blog Site. I think firstly I should bring this year up to date. It was really great to meet everyone at our first Show of the year in Exeter and make new friends, meet old friends and hear about your craft groups and see some of your projects. What a talented lot you are, the cards using our 4 Poppy Stamp were inspired. Our trip to Manchester, through all the snow and ice was a delight! All that gritty Northern humour, we love it! Obviously to see old friends from Newcastle was really wonderful and to know that you haven't forgotten us was so nice. Please come and talk to us at Harrogate and tell us all your family news, so we can keep up with everyone. At least the weather was kind at Farnborough this year and you seemed to like the new roller patterns. Dogwoods seemed to be everyones favourite. We must also thank everyone who made Hinckley such a success and to everyone who was supportive and encouraging at my Demo all I can say is, Thank you Girls!